Geoff Twentyman: Secret Diary of a Liverpool Scout - LFChistory - Stats galore for Liverpool FC! For any Liverpool supporter with an interest in the club’s rich history, this is one of those “must-read” books. Geoff Twentyman’s name is not one that will be immediately associated with success. Author Simon Hughes, however, finally brings to the public’s attention the astonishing work Geoff did as Liverpool’s chief scout for almost 20 years, a period that brought unparalleled success to the club through a succession of players and managers. Hughes has been able to do this thanks to the discovery of the meticulous diaries kept by Geoff himself during the years of his scouting for Liverpool, by talking to numerous well-known players, some of whom joined Liverpool and some of whom did not and by meeting and hearing the memories of Geoff’s own family, principally his son William who still lives on Merseyside. There is no doubt that Geoff Twentyman is held in the highest regard by them all. Former Liverpool players that now hold legendary status amongst the club’s massive fan-base have been moved to say things like “I loved Geoff. It’s about time he gets recognition for all his work at Liverpool” (John Toshack) and “I owe my life to Geoff” (Phil Neal). Many of the players discovered by Twentyman won honours beyond their wildest dreams. Hughes does not claim that Twentyman’s role was more important than any other employee of the club at the time. 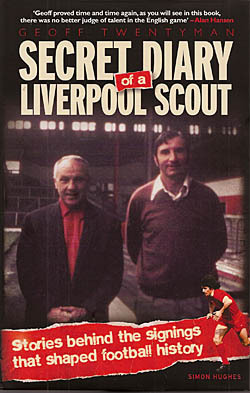 But he has thoroughly researched this wonderful book and given a rare glimpse into the workings of a professional football club that was run efficiently from top to bottom, an efficiency that reaped its rewards in terms of trophies won on a regular basis, certainly during most of the time that Geoff Twentyman was in charge of Liverpool’s network of scouts. The early chapters of the book cover Geoff’s upbringing and entry into football as a player with Carlisle in 1947. Less than two years later Bill Shankly was appointed as manager of the Cumbrian club with the significant impact that each would have on the other’s life. Former Carlisle player and manager Ivor Broadis was also mesmerised by the Shankly personality. Says Broadis, “That’s why he and Geoff got on so well. They both had very similar values about honesty. When Bill became manager, he immediately moved Geoff to centre-back and made him captain – a position and role he considered very important. He did a similar thing with Ron Yeats as soon as he joined Liverpool years later”. Shankly moved to Grimsby Town in 1951, by which time Twentyman had become an integral part of the Carlisle team. The player’s early impressions were significant: “Bill was a tremendous fella. One of the best in my lifetime. It was great playing under him just for his enthusiasm”. Another tribute comes from respected football writer John Keith: “Shanks made Geoff his captain at Carlisle because he had all the qualities that he looked for in a human being first and as a scout second. He was honest, loyal and wasn’t flashy”. Geoff’s consistency brought him to the attention of other clubs. Wolverhampton Wanderers were impressed enough to make a bid of £10,000 but Carlisle eventually accepted an offer of £12,000 from Liverpool. Twentyman openly admitted years later in a radio interview with Merseyside’s Billy Butler that he already felt an affinity with the people of the city, having met many Liverpudlians during his time in the Armed Forces while completing his period of National Service. “They were passionate people”, he recalled. “It made me want to go to a place like Liverpool”. A pleasant and encouraging letter written by Shankly a day after Twentyman signed for Liverpool is reproduced in the book. Bill’s kind words proved that the bond between them was already a strong one … and it would become even stronger after Shankly too moved to Liverpool in 1959. Geoff’s career as a Liverpool player was a modest one; 184 first-team appearances in the dark days that followed the club’s relegation from the First Division. He had been brought in by manager Don Welsh in an attempt to shore up a defence that had been leaking goals for fun in the relegation season itself, 1953-54. But although he played in every League match from making his debut in the middle of December until the end of the season, Geoff’s introduction occurred too late to prevent the slide into the Second Division, the team only winning 9 League matches all season and it wasn’t until early-April 1954 that Geoff was able to celebrate being part of a Liverpool team that took maximum points from a First Division fixture. Twentyman played fairly regularly for Liverpool for the rest of the 1950’s and was a member of the team humiliated by Worcester City in the F.A. cup in 1959. 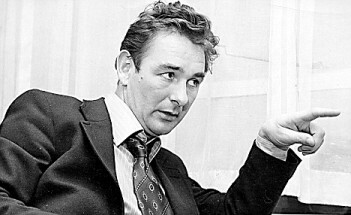 This miserable defeat, one of the lowest points in the club’s history, led to Phil Taylor resigning on the 17th of November but within days of Bill Shankly being appointed to replace him two weeks later, Geoff Twentyman had already decided to move across the Irish Sea to become the player-manager of Ballymena United. Geoff stayed in Northern Ireland for four years before returning to the British mainland for a second and much shorter spell with Carlisle. When his playing days were over, he became the manager of non-League Morecambe before accepting an offer to manage Hartlepools United on the other side of the country, a position he held for only three months before being controversially replaced by Brian Clough. When this happened, Geoff’s wife was pregnant with their son William. The Twentymans were given one month to leave their Hartlepool house because Clough wanted to move into it. They still owned a property in Carlisle but that was being rented out. William recalls with some bitterness, “Brian Clough had my mum and dad turfed out before the end of the month’s notice. My mum hated Clough for that. She resented him for the rest of her life and wouldn’t hear a good word said about him”. William’s father was unable to find another job in football. He worked in Carlisle as a van-driver for a while but was considering trying to get a job with Ford’s in Halewood, south Liverpool. On the very same day that he was planning to travel to Merseyside, LFC’s chief scout Norman Lowe left for America. Not long afterwards came the contact from Bill Shankly that would change Geoff Twentyman’s life … and also Liverpool Football Club’s fortunes. Shankly gave Twentyman the chance to (a) replace Lowe as chief scout and (b) combine an already-strong friendship with a different sort of working relationship from the one that had marked the two mens’ time in Carlisle in the previous decade. Having explained the steps that led to Geoff Twentyman’s appointment as Liverpool’s chief scout, Simon Hughes then turns to the role itself before starting to highlight the seemingly endless stream of professional footballers that Geoff went to watch, with successive chapters dealing with the 1960’s, the 1970’s and the 1980’s. READ ON FOR TWENTYMAN'S SCOUTING DAYS AT LIVERPOOL UNEARTHING REAL GEMS FOR THE REDS AT THE NEXT PAGE.